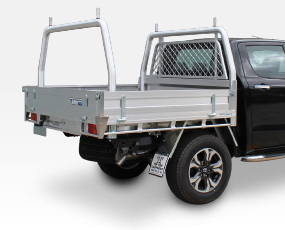 All Tip Top Equipment’s Aluminium Tray Bodies and Trundle Tray storage drawers are guaranteed against failure under normal working conditions for the life time of the vehicle, to the original owner. This does not cover normal wear and tear of the product, accidental or malicious damage or incorrect fitment to vehicle by someone other than Tip Top Equipment. 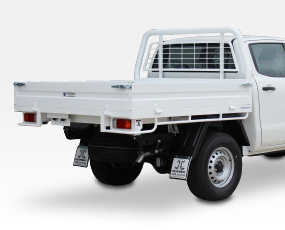 All Tip Top Equipment’s Aluminium Tray Bodies are built and fitted by Tip Top Equipment according to the ADR National Vehicle Standards, Bulletin No.6. Lifetime warranty does not apply to Steel Trays. Steel Trays are guaranteed against significant rust for a period of 12 months. This does not include rust caused from normal wear and tear. Where practical, the purchaser should return to Tip Top Equipment’s factory once every 12 months for an overall check and to have all mounting points tightened. If this is not possible, then it is the responsibility of the owner to have his/her mechanic tighten all mounting points and lubricate your hinges and catches when vehicle is being serviced. Where the tray body meets and is in accordance with the standard, Tip Top Equipment cannot take any responsibility for any partial obstruction of the side rear view mirror visibility. If the dealer or customer is of the opinion that the existing mirrors are insufficient, then it is their responsibility to organise and fit an alternative. Where a cab roof protection bar is fitted to a tray, Tip Top Equipment disclaims all responsibility as to the possibility of the bar creating wind noise. Where possible, we endeavour to warn customers prior to purchase, of this problem. As the problem varies according to the vehicle shape, no universal solution has been found, though every endeavour has been made to reduce the likelihood of it occurring. Warranty on tool and storage boxes is limited to whatever is given or implied by the original manufacturer. No guarantee is given or implied on any box as to its ability to prevent theft of equipment stored therein. The purchaser makes the decision based on his/her judgement as to which is best suited to the job on hand. 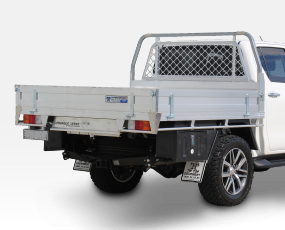 Warranty on tonneau covers is limited to 12 months on cover fabric. No warranty is given or implied on shock cord as it is a wearing part. These terms and conditions of sale shall apply to the exclusion of all others and any terms and conditions of the purchaser (whether on the purchaser’s order form or otherwise) which are contrary to or inconsistent with these terms and conditions shall not apply, nor shall they constitute a counter offer or variation or waiver hereof. No goods will be supplied by Tip Top Equipment Pty Ltd (Tip Top Equipment) on any terms and conditions other than those set out herein, and by making application for credit or taking delivery of the goods the purchaser shall be deemed to irrevocably agree that these terms and conditions shall apply to the exclusion of all others. A - PRICE: Unless agreed by Tip Top Equipment in writing to the contrary the price payable is Tip Top Equipment’s current price at date of delivery. We reserve the right to adjust prices within a reasonable scale under changed conditions, in particular cost increases relating to scales of wages, regulated prices for materials and parts, freight and duty charges of imported componentry or merchandise etc. Non account customers: payment is due within COD days from the date of delivery. Should there be any default in the above payment terms, all monies owing by Customer to Tip Top Equipment shall become immediately due and payable. Tip Top Equipment reserves the right to charge interest at 20% p.a. on default of agreed payment terms, such interest to be calculated on all monies and costs due or overdue up to the date of payment. All expenses, costs or disbursements incurred in recovering any outstanding monies including debt collection fees and solicitor’s costs will be paid by Customer. Tip Top Equipment reserves the right to withhold the supply of goods and services at any time without notice to Customer. 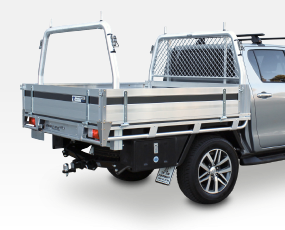 C -WARRANTY: All Tip Top Equipment’s Aluminium Tray Bodies and Trundle Tray storage drawers are guaranteed against failure under normal working conditions for the life time of the vehicle, to the original owner. D - RISK: All goods after delivery are at the purchaser’s risk and must be paid for notwithstanding the destruction thereof or any damage thereto however caused. In the event of the determination or repudiation of this contract (howsoever occurring) Tip Top Equipment is hereby irrevocably authorised to enter on to the premises of the purchaser and repossess the goods and any other goods in the purchaser’s possession, the property, which is vested in Tip Top Equipment. The purchaser will keep the goods free from and will indemnify Tip Top Equipment against any charge, lien or other encumbrance thereon. Further, the purchaser agrees that it shall forthwith upon demand made orally or in writing by or on behalf of Tip Top Equipment, deliver all or cause to be delivered to Tip Top Equipment goods, property in which has not passed to the purchaser. Tip Top Equipment and the purchaser agree that these terms and conditions are not intended to create or be construed as creating hypothecation in respect of the goods. E - PROPERTY: The property in the goods does not pass to the buyer until payment has been received in full by Tip Top Equipment. Notwithstanding the other terms and conditions, goods are sold on condition that the ownership of the goods shall remain with Tip Top Equipment and no property in the goods whether legal or equitable shall pass from Tip Top Equipment and that the goods will be held by the purchaser as bailee and will be sorted separately and in such manner that they can be readily identified as the property of Tip Top Equipment until payment of the full price has been received for all goods delivered to the purchaser after the date hereof. Of all other goods the subject of any other pre – existing contract between the seller and the buyer. F – BUYER’S ORDERS: No changes will be accepted to Buyer’s Orders unless agreed upon and notified in writing. Any costs associated with changes made to the order are to be borne by the buyer. G - DISCREPANCIES: No changes will be accepted to Buyer’s Orders unless agreed upon and notified in writing. Any discrepancies must be notified within 48 hours of the completion of the job. H - RETURNS: If any goods are to be returned they must be returned within 7 days, in their original condition/packaging unused. A 10% restocking fee applies. I - ACCEPTANCE: Upon delivery of the goods, the buyer is deemed to have accepted these terms and conditions. J: If the customer is a Trustee, the Directors warrant that they have the authority and power to enter into this agreement and personally guarantee the performance of all the trusts obligations under this agreement. K: These Terms and Conditions of Trading are additional to with any other Terms communicated in respect of the sales of goods, and where they are in conflict, these Terms and Conditions of Trading shall prevail. L: Any dispute or action in relation to these Terms and Conditions of Trading shall be subject to the absolute jurisdiction of the laws of the State of New South Wales. M: These are Terms and Conditions of Trading shall be binding upon Customer its successors, executors, administrators and permitted assigns and shall inure to the benefit of TIP TOP EQUIPMENT PTY LTD, its successors and assigns.